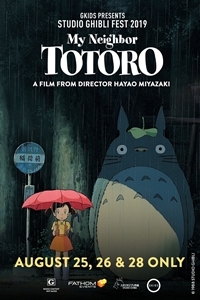 Join Fathom Events and GKIDS when they bring the beloved classic from the Academy Award®-winning director Hayao Miyazaki back to theatres as part of Studio Ghibli Fest 2019. When Satsuki and her sister Mei move with their father to a new home in the countryside, they find country life is not as simple as it seems. They soon discover that the house and woods are full of delightful creatures, including a gigantic forest spirit called Totoro!